Rare Nobel Prize won by a female physicist, Donna Strickland from University of Waterloo in Canada. Since a 5:30 phone call from the Nobel committee on October 2, Professor Donna Strickland (University of Waterloo, Canada) made the headlines worldwide, for being awarded the Physics Nobel prize, which she shared with the American physicists Arthur Ashkin and Gérard Mourou of France. Together with the French physicist, she is credited for her major contribution to the field of high-intensity laser pulses. Indeed, the method that she co-invented, under the supervision of Professor Gérard Mourou, during her PhD studies has revolutionized the contruction of lasers and opened a new field of optics and physics at large. In this short paper, we briefly describe that discovery, but we mainly want to reflect Professor Strickland, as a woman in Physics, and the fact that she is only the third woman in 117 years to win a Nobel Prize for physics. Modern lasers are strong enough to do precise surgery, to drill thick metal parts in the industry, or destroy various targets in warfare. Like bombs which possibly produce very strong blasts by concentrating mechanical energy in the shortest possible explosions, the key is to produce ultrashort light pulses with the highest possible energy, leading to a very high light power during the pulse. Soon after the invention of lasers in the 60s, the capacity of scientists to produce high power pulsed laser stalled for more than 20 years, for the simple reason that lasers could not produce a light power that would destroy them. Thanks to the 1985 discovery of Professor Strickland and Mourou, lasers were no longer at risk to be destroyed by producing highly destructive light pulses. This unleashed a race that never stopped since then, with exponentially growing power limits, and this year’s record is truly astonishing. It is now possible to shine, one 1 square centimeter, the same light intensity as the intensity that would be produced by focusing the power of the whole sun on 1 square meter. Briefly, the trick used to concentrate light into high intensity pulses is called CPA -chirped pulse amplification- and it relies on three steps : first stretch pulses in time, second amplify them, and third recompress them in time outside the laser to avoid its destruction. Professor Donna Strickland’s discovery was the first stone of the science of modern ultrafast lasers. 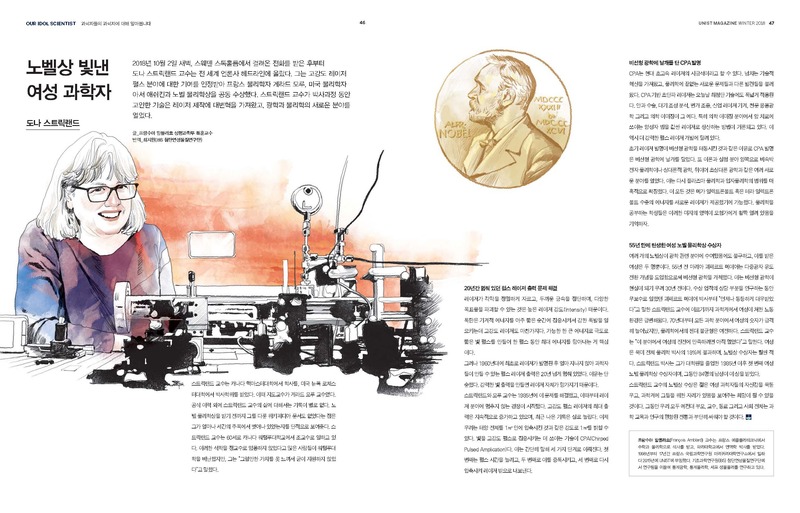 It has brought a wealth of technological innovations and opened the way to a never ending succession of new problems and discoveries in fundamental physics. In the realm of novel technologies, CPA-based ultrashort pulsed lasers are used in a wide set of applications, from eye surgery, chemical analysis of the atmosphere, lightning control, industrial laser-machining, adaptive optics for astronomic observations, and medical imaging. In the latter domain, in particular, what is at stake for reaching higher pulse powers, is the possibility to use lasers for producing proton beams for cancer therapy. However, none of these applications would exist if not preceeded by an intense multinational basic research effort. Indeed, for the same reason that the initial discovery of lasers has launched the field of non-linear optics in the early 60s, the discovery of CPA boosted the field of nonlinear optics, and launched multiple new fields for theory and experiments, such as the physics of unbound electrons, relativistics optics, and soon ultra-relativistic optics. These novels fields offer fascinating extension to plasma physics, atomic and particle physics, simply because these new lasers produce the needed energies, typically in the Mega- to Tera- electronVolt. Students in Physics should contemplate the extraordinary terra incognita now opened for them to explore in these fields. Despite the fact that multiple Nobel prizes were awarded in these optics-related fields, only two of them received it. 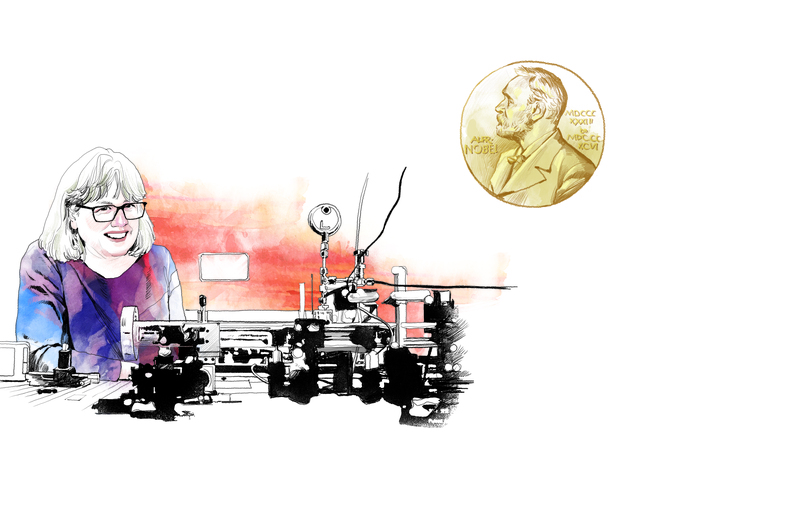 55 years ago indeed, Maria Goppert-Mayer pionnered nonlinear optics by introducing the concept of multiphoton-induced transitions 30 years before it could become reality. From Dr. Goppert-Mayer who went unpaid for much of her award-winning research to Prof. Strickland saying that she has “always been treated as equal”, the condition of women drastically changed. Indeed, since the 70s, the number of woman in all sciences together has dramatically increased, with now less men than women. However, gender imbalance strongly persists in Physics, and Prof. Strickland is “far from satisfied with women’s progress in the field”. 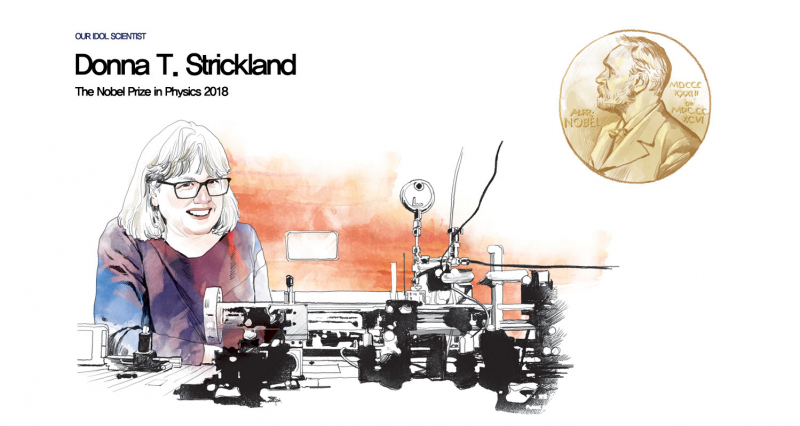 Woman only represent 18% of Physics PhDs across northern America, and even less of the Nobel prize awardees, since Prof. Strickland is the first Physics Nobel woman, out of 84 mens since she graduated in 1985. Let’s hope that the celebration of Professor Strickland’s discovery help more young woman build self-confidence and see that their is a place for them in science. Meanwhile, let all of us, parents, professors, colleagues, and the society at large, actively fight against the tradition of gender biases in science education and research. Distinguished Professor François Amblard in the School of Life Sciences at the Ulsan National Institute of Science and Technology (UNIST) received a Master’s degree in both Mathematics and Physics from Ecole Polytechnique in France. He obtained his PhD in Immunology from Collège de France under the guidance of Professor Alain Fischer (pediatric immunology) and Dr. Charles Auffray (genetics). For the years 1998-2015, Professor Amblard served as a group leader at CNRS-Curie in France. He joined the IBS center in 2015 and currently serves as a group leader of the Institute for Basic Science Center for Soft and Living Matter at UNIST. His research interests lie primarily in the areas of statistical physics, statistical optics, biochemistry, self-assembly, cell biology, and multicellular assemblies.